There are quite a lot of sales to take advantage of this time of year, so how's a fashion girl to choose how to spend her hard-earned cash? If it's any help, our go-to strategy when shopping the end-of-season sales is to focus on the ones that only happen once a year, like Madewell's 30% off sale that's happening now through Christmas Eve. Madewell site-wide sales aren't particularly common, especially with discounts this high. Understandably, the pickings are slim, but we found a slew of stylish pieces that are still in stock (at press time) and that you'll undoubtedly wear on repeat. From a puffer that's actually flattering to a pretty bag that's very on trend with spring (and that we can't believe is on sale), these are the best pieces to buy (in our opinion) from Madewell's pre-Christmas 30% off sale. Shop our top nine must-have pieces below! 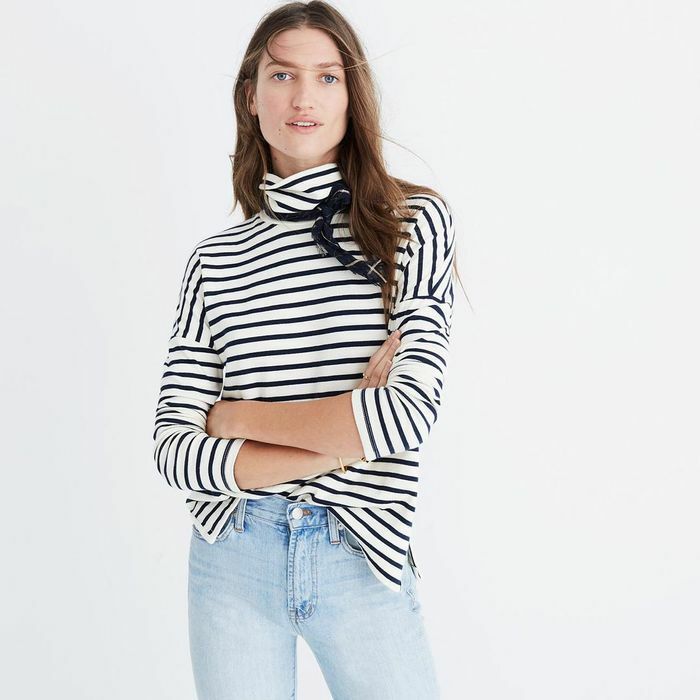 This perfect striped turtleneck is worth every penny. Everyone wants a checked coat this season (including us). We'll never tire of a pretty star print. These comfy, cool flats are an excellent investment. Don't wait this flattering puffer is selling out fast. Perfect for those 60-degree winter days. We want this cozy, best-selling sweater in every color. Spring's It color and It bag style, all in one perfect on-sale package. Gotta love a party dress that you can still get away with wearing to work. Next up, shop seven pairs of skinny jeans we can't believe are on sale.